Dreaming of that early Strat tone from the 50’s & early 60’s? 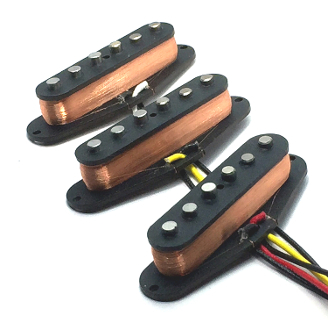 Dragonfire Pure Vintage Strat pickups are offered here to give you just the tone you crave. The AlNiCo 5 (AV) magnets in these pickups are highly charismatic and provide warm, smooth tone for a less harsh result. Alnico magnets can help give you with a well-rounded and dynamic outcome while still allowing for plenty of attack and coherence. These are dedicated position pickups for performance enhancement and differentiation. Each pickup is wound specifically for a position and the Middle position pickup is Reverse-Wound and Reverse-Polarity (RWRP) to ensure the best possible set execution and collaboration. RWRP offers hum-cancelling in Positions 2 & 4. These pickups are not position interchangeable. Beveled vintage style slug polepieces with a gentle edge slope add depth and subtle detail. Staggered poles allow for balanced output as well as maximum string response and set-up options. These are 2-wire pickups that come with a colored hot and a black ground wire for easy installation. 250K pots and 0.022 or 0.047 tone caps (available separately) are recommended for use with these pickups.